So I have called this lecture two things. I called it 'The Lord Maitreya and the Children of the Heart', and explained that I would be talking about the change coming into the world and the New Age and the new humanity. I have also called the lecture 'Paramartha Yoga, Realisation of Spirit', because it is the same thing really, Paramartha Yoga being the latest yoga that the Hierarchy is introducing, which means the yoga of Divine Truth or the Spirit of the Heart. It’s all Spirit because we have entered into the Age of Spirit. But let me start from a beginning. See, the Hierarchy, and I’m just going to quickly show you on the projector for the ones of you that have perhaps not heard about the Hierarchy, or do not know about the Hierarchy, just show you a picture of it. I will explain just quickly for you to know what I am talking about when I use different terms. The Hierarchy on Earth is built up with the top man in the work being the Lord of the World, Who is called the Lord Sanat Kumara, coming down from Venus 18 million years ago with a hundred and some Kumaras. The Lord of the World took with Him not only a lot of Kumaras but a mighty entourage of Masters and initiates from different planets. And He came to this Earth as a great sacrifice because the Earth was in dreadful circumstances, it was near total destruction. And He and the Hierarchy on this Earth have created what you call humanity, those of you all sitting here, part of humanity, you have been created by the Hierarchy – that is, your appearance, the way you have built certain bodies around your soul, or say, your soul has built certain bodies around you and so many other things. The second office next to the Lord of the World is the Buddha Office, and though we have several Buddhas on this planet we have only one who sits in the office, for the time being, the Lord Gautama Buddha, Who became Buddha 2,500 years ago. ​Underneath the Buddha Office, is the Christ Office. The Christ Office, there sits the Lord Maitreya as the Bodhisattva or the Christ of Earth, being helped by two assistants, Jesus and Kuthumi, two great Christed Masters. On both sides, on the blue it says the Manu, that’s the First Ray Department, which is governed by an enormous entity called the Manu, which I will explain when we come to the school on Saturday, when we talk about karma. And then the green is the Lord Mahachohan, which is the Lord of the Holy Spirit, or the Lord of Civilisation. And we have the ancient Lord Mahachohan and we have the newest Mahachohan which is the Count of Saint Germain, working under His new name, Master R.
And many of you here, many New Agers and people who study the Divine Wisdom, whether they are Rosicrucians or members of the Theosophical Society or anything really, who are into esoteric work of some kind on some level, know about the Lord Count of Saint Germain of the Seventh Ray, the Violet Fire. Underneath, the plum coloured, that’s the colour of all the Chohans, the great Masters of the 6th degree, the Christ being the 7th degree, the Buddha being the 8th degree and the Lord of the World being the 9th degree initiation. 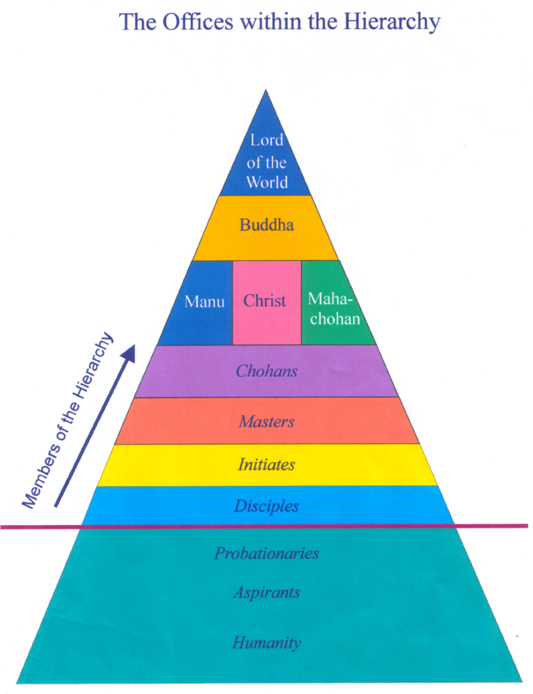 The Chohans are the Masters that we call the Masters of the Great White Brotherhood or the Hierarchy. And there are seven Ray Masters and Their assistants, and a number of ashrams and sub-ashrams to which disciples belong on this Earth. Underneath the Chohans we have Adepts, or Masters of the 5th degree, then we have the initiates, we have the disciples, we have probationaries and so forth. Now let us see how it all started. Two thousand five hundred years ago the Lord Gautama became the Buddha of the Earth through His physical embodiment that He took on. And He became the Enlightened One, the Lord of Wisdom and Light. And He introduced a number of laws and disciplines, teachings to humanity. His Brother, the Lord Maitreya, Who came next – They had tried together to become the first Buddha, for thousands of years – He became the Christ. The Lord Gautama Buddha has sat in the Christ Office for thousands of years before. And from the Christ Office we have the office that governs all religions on Earth. There is not a religion that has come to Earth, that has descended to Earth through a teacher, an avatar, a Cosmic Avatar, or just an initiate, that does not come from the Bodhisattva Office. You’ll hear about that in the lecture tomorrow about avatars. I’m just quickly going through certain things so we can get into my lecture tonight on the Children of the Heart. And then when the Lord Maitreya became the Christ, then They started to gather all the initiates and disciples who were to be trained for the Jesus embodiment 500 years later. And the one who was going to overshadow Jesus was the Lord Maitreya Himself. The Lord Maitreya was actually incarnating through Jesus. It is called an overshadowing principle where a Master can use the body of another Master. This you will hear about tomorrow at the lecture about avatars, because it sounds complex but it’s really not complex when it’s really pointed out to you how it’s being done. What happened was that this impulse, enormous impulse of light and love, streamed forth unitedly for the first time on Earth. For the first time, through Jesus, humanity came to know God, or Logos, as Love. Other religions had been introduced to different gods, or one god-being with certain qualities, but never love. And what was in preparation was something that people didn’t know. Namely 2,000 years later we would have the Lord Maitreya reappearing on Earth, creating the Way of the Heart, and the Children of the Heart, the new humanity, which some of you, or most of you, are part of. And in order to create this new humanity, it took 2,000 years of very hard work with a number of chosen souls who were going to work as teachers in this day and age and lead humanity on Earth who were ready for the next step to become Children of the Heart. ​Because what is changing is, next picture, just quickly to explain to you: This is called 'The Offices within the Hierarchy and the Master or Masters currently in that Office'. We are going to see enormous changes, so many changes have we never had in 18 million years, or ever on this planet. Because now the old Hierarchy is preparing for a new Hierarchy and the old Hierarchy, many of the Masters are leaving the Earth for other planets, for life and work on other planets. And it’s all happening in 500 years when the Lord Maitreya incarnates as the next Buddha of the Earth. And though you may have heard from Tibetan Buddhism, or Buddhism or other teachings, like Theosophical teachings, that the Lord Maitreya is not incarnating for the next two, three thousand years, well, if you understand that this is illogical – what I am telling you is: there is no longer than a 500 year wait. The Lord of the World, Sanat Kumara, has been assisted by the Lord Gautama Buddha and the Lord Maitreya in His office. The Lord Sanat Kumara is slowly leaving the planet Earth. But the Lord Gautama Buddha is not taking over, even if some new books have stated this fact, that the Lord Gautama Buddha becomes the next Lord of the World. The Lord Gautama Buddha is leaving the Earth in 500 years. ​​The one who takes over is the Lord Maitreya, Who has a very short sojourn being the Buddha and actually already into the next office. ​When I say leaving, it happens over a number of hundreds of years. It doesn’t happen like when you leave a job for another job, because you have children or you have something else happening. ​Usually you leave in a week, two weeks at the most. But the Hierarchy, when They change offices, They change over hundreds of years, because to them time is not what it is to us. the Buddha of the Earth for a short time. And the one who takes over the Christ Office will be the Lord Kuthumi, because the Lord Jesus is also leaving in 500 years. He has been for so long on this Earth as the Lamb of God, which is the title of a Messiah Who incarnates constantly to sacrifice Himself that the planet upon which He lives and humanity will survive. So His job is over in 500 years on this planet and instead the Lord Kuthumi, Who perhaps many have heard of as the second ray Master, takes over. The Manu’s Office, the Manu, the first ray Department, our Manu in this fifth root race to which we belong – again Manu will be explained at a later date – that office will be taken over by the Lord Morya, Who becomes the Manu of the next root race. The Mahachohan’s Office has just been taken over by the Lord Master R, but still the old Mahachohan is there. 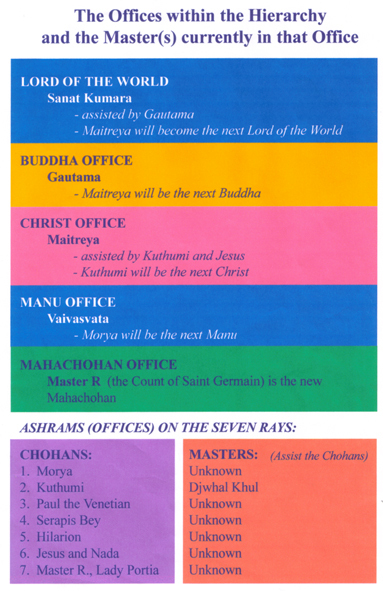 Underneath we have the ashrams or offices of the seven rays. We have the Chohans, Morya on the first ray, Kuthumi on the second, Paul the Venetian on the third, Serapis Bey on the fourth, Hilarion on the fifth, Jesus and Nada on the sixth, Master R and Lady Portia on the seventh. We only know of one assistant by name, Djwal Khul on the second. See, all the Masters, if They make themselves known, are making Themselves known with one letter, like Master P, Master T, Master K, and unless They contact you personally, you don’t know Their real names. But these have been here for so long that They have names that we use that They let us call Them, though in fact They have other names as well. But this is just to explain to you the Hierarchy and certain names that I mention in this lecture. Now let us take it from the beginning. The Lord Jesus became a World Teacher Who has been given the name of God, which He never wanted for Himself, the Son of God, through the Roman Catholic Church. He was a Master incarnating, He was a Son of God, a true Son like all the great Masters, but He wouldn’t like to be called a god. However, He has been made to look like that and has become the figurehead of the Christian Church. And because He’s been made the figurehead, that was okay really because His energy has gone through all of the Piscean Age. He is still for all Christians the Master Who deals with the Christian Church, trying to transform the Christian Churches on Earth today. But what many people didn’t know was that Mary Magdalene, His very close disciple, was actually also His wife and that the idea was to build upon Her as the Mother aspect of the new Church. However, it didn’t happen 2,000 years ago, where the Roman Catholic Church became a very patriarchal Church, built upon men and men’s work only and the women, if mentioned at all, not with very nice names. Kept well in the background as stupid imbeciles, or mothers, or prostitutes, or something like that. However, we have entered into the Age of Maitreya, and in the Age of Maitreya, which is starting year 2006, that Lord Maitreya is working with the Mother, through the Mother, with big 'M'. That means through women in order to create balance and harmony in religions and in spiritual work. Which is why we see both in the heavenly world and on the physical level, many women taking higher positions, even within the Church, and more and more in politics and in business and so on. The Church that is built upon the Mother aspect, the Mother God aspect, is a Church which the Lord Maitreya uses as a vehicle to come through to the planet Earth’s physical level and through this Church which is an energy, He is trying to contact all of those of humanity who wish to become Children of the Heart. Why they are called Children of the Heart is simply because all the people who are now disciples of the Hierarchy, and probationaries and higher aspirants, are actually more used to being Children of the Mind. For many hundreds of years they have developed enormous mind capacity and have become, have been the greatest intellects that this Earth has ever seen. But because the intellect through the mind has grown out of proportion, we have also many people who were meant to be pleasant and enjoyable people, very cruel and arrogant and cold. And the time has come where the Lord Maitreya is going to stimulate the heart chakra in humanity, creating a new human race called the Children of the Heart. And that race will inhabit the new planet Earth – the Earth after the great change. We are on the verge of an enormous change on this Earth, greater than any other change we’ve ever had, because it’s global. Before, if we had changes they occurred in certain nations or countries only, but never globally, totally spreading throughout the entire Earth. And because the Lord Maitreya has taken on the role of becoming the Spirit of the Earth, He is calling to those in humanity who respond to His call and He is trying to gather them together, to train them over some incarnations to be with Him when He comes in 500 years, recognising Him as the great new Cosmic Avatar. And through those people who He trains now He will spread the new world religion. And this world religion will encompass all world religions at that stage. It will be more simple to live on Earth after the 500 years have passed. Humanity will be more united and by then we shall have governments that govern if not the whole Earth, big parts of it, and people will have found out that there is a simple knowledge that comes through all religions and that is the same for all religions. So the Children of the Heart are those Children of the Mind, or Children of the Heart – though not very many of them on the Earth at the moment, but coming from other planets – who actually will live through the heart for the Lord Maitreya, with the Lord Maitreya, following His Laws of the Heart. And following the Laws of the Heart means that we should have something like peace on this planet. We should have a gradual decreasing of diseases, early deaths and all that. All that you dream about shall come true, but in 500, 700 years from now. We unfortunately have something called the great change to go through. And the great change is not meant to happen in the blink of an eye. Neither did Lemuria and Atlantis go down with the blink of an eye, even though some say so. Actually people were warned hundreds of years before and some parts went down in cataclysmic actions before other parts. So we have been warned by the Hierarchy very much here in the 70’s that Earth changes would occur that would change the surface of the planet Earth. But not only that, it would change the way we live. And that Earth would only be inhabited by people who wanted to do good, to live by the will, the goodwill. And others would be transferred to other planets, which has happened over many other times in the history of the universe. It’s just that we have now come here on Earth to an enormous immigration of souls, other souls are coming to Earth who are more heart-minded and many souls are leaving, who cannot follow the Earth’s development, but after death will go to other planets that are ready for them. So we have here on Earth enormously many things happening. It’s the most exciting time in Earth’s history, but also of course a frightening time. That we have to learn to live with spirit, we have to find spirit within ourselves, we have to learn to obey the Laws of Spirit and then our fears will disappear. Because the Lord of Darkness, who is the contrast to the Lord of Light, is ruling this planet through fear and fear makes people believe in things that are not true. And so what we mean by the Christ Principle and the anti-Christ Principle, actually very strong on Earth at the moment, is that anti-Christ is the darkness ruling through fear, which is totally against Christ, and the Christ ruling through love and understanding. The new humanity will be part of the new root race that is building up. And a part of that new humanity will be turned into a new race where they’re half devas, half angelic entities, and half human. That is what we are terming winged healers. A winged healer is a person who is more and more on the inner becoming half angel/half human, and displaying a new vibration, new keynotes, and will work with healing, being able to heal people, also to help them to pass away if necessary and creating certain effects in them. It’s all part of the Lord Maitreya’s work on the planet. We are trying to train people who feel that they could become winged healers with effort, in the Theosophical Healing School, which is facilitated by Tara and Chris. But it’s an interesting structure of humanity that’s coming and you wouldn’t notice if you weren’t able to look with clairvoyant abilities deep, deep within the aura. See, many people think that human beings are all the same. But as I have often mentioned we’re not the same at all. We may be sisters and brothers on the physical level but within our inner bodies we are absolutely not the same, and within our souls we are very different from each other, though we may display certain of the same virtues and defects. On the physical level we all look like we look now. Human beings, two legs, two arms, a nice smile hopefully and a brain somewhere in here and somewhere a heart. But we are from different places in the universe and we have been gathered on this Earth to learn something of special lessons to be learned in order to become Adepts, or Masters, perfected beings. Well, it is so that on this Earth we have these perfected beings who have gone before us and They are now part of the Hierarchy. They’re the ones that govern the evolution; They’re the ones that notify Their disciples about what they need to know. And how They use me, and the Fellowship, is to teach about the Lord Maitreya and the Maitreya Impulse that has started to come down since 1975. In 1875, the Theosophical Impulse saw the opening up of the Theosophical Society where for the first time, through Madame Blavatsky, the knowledge of the Masters actually was released to humanity. Lots of knowledge was released that had only been known of by very few people. And through the Theosophical Society a lot of books came into manifestation about the laws of karma, reincarnation, and some correct, some not correct – it is very difficult to be a vehicle on the planet Earth with all the disturbance there is around here, to write only correct knowledge. But the knowledge of the Hierarchy was revealed and 100 years later in 1975 the Hierarchy continued with the same impulse but it was now the Lord Maitreya that sent the impulse down instead of members of the Hierarchy, and it has become the Maitreya Impulse. Why it has become that is because the Lord Maitreya has taken a rein of things, of affairs on Earth. And that people are being very, very educated and trained on the inner levels without knowing it, for the time we are about to enter. Australia plays a very important role in the work of the Lord Maitreya, for it has been chosen as the country from which the Lord Maitreya will enter into the western world, meaning America, when time comes. Now it’s interesting, isn’t it, that so many people, spiritual people, are working in America. So many disciples, even Masters, live in America. But America has not been chosen as the Lord Maitreya’s country, Australia has been chosen. And Australia’s going to see many millions of Children of the Heart living here, incarnating here and living here over the next 100 years. Gathering together, one day all living in the place you now call Uluru. The Lord Maitreya has actually planned this for thousands of years. And when He said that He, the Christ, the Lord Maitreya would return on Earth, He meant through all the people, through all the Masters, initiates, disciples, aspirants, people who could hold His vibration, and raise their consciousness to His consciousness and work with Him. But He chose this country as the country that will become the new country of the heart. Where India has been the country, the land of the heart, for a very long time, Australia is slowly becoming the land of the heart, the country of the heart. It will take time but it is started and it is wonderful to see what’s happening. Many of you who know about the existence of the Great White Brotherhood know that some of the Masters have retained a physical form to be in contact with humanity. And They live in certain countries of the planet Earth, Tibet and India see most of them. But They’re actually moving from Tibet to South America and to Australia and to other countries that They have never lived in before, and this is due to the great change. Some countries will disappear from the map of the world and others will see new life, new birth. Australia is a very ancient country but it is still a virgin country, it’s called, because even though it has not the most pleasant national karma after the abuse of the Aboriginals over the last 200 years, it still is a country that has very little experience, very little, you could say, history of a certain nature. And the Lord Maitreya has chosen this country to create a new society. It’s nothing new, this new society. It’s not that you haven’t seen it before, a society where we live in a positive way. But it is a society which is built up around the light of Maitreya and His Laws. So what the Lord Maitreya’s trying to create is, He’s trying to create a focus, an energy here that will take 200 years, in Victoria, the state of Victoria has been chosen first. Even though He works through different people all over the planet, this kind of work where He talks about the Children of the Heart and gives out the Laws of the Heart and trying to teach certain people what can be expected in the New Age, well, that He’s creating in this country obviously. Because you must understand with the Masters, that the Masters have enormous work and initiates or disciples are given different roles or assignments to perform. But our assignment is to try to get hold of the Children of the Heart – most will respond in their next life not this one – and train some of them, as best we can so they can work as teachers of the Children of the Heart in their next embodiment. It happens both consciously through the Fellowship and unconsciously perhaps through other organisations that don’t know this yet, but still working towards the same purpose and goal. Even though many organisations speak about the Lord Maitreya – Summit Lighthouse does and I believe the I Am Movement, and the Liberal Catholic Church know that they work with the Lord Maitreya on a higher level – it is not many people who realise what the Lord Maitreya really is. And that His Presence is coming to certain people on Earth in order to be known. Because you have never known Him the way He reveals Himself now. You have known Him through other beings and through other personalities. But you’ve never known Him as the straightforward Lord Maitreya. And He wants you to know Him so you can recognise Him and His vibration in other lives to come and be with Him in His mighty task in 500 years. If you know a little bit about something called the Plan of the Hierarchy, you would know that these plans are millions of years old, or thousands of years, or two thousand years plan, 500 years plans, and it’s now that we are in a very, very exciting 500 year plan again. Because we are now training for a specific purpose, to bring forth His incarnation in 500 years. And if you believe that He will come, He will come. You see, we create it with Him so that He can come. If you speak about the Lord Maitreya, 'well, He’s not coming, not coming before thousands of years, we’re not ready, we’re not worthy, we’re not this and we’re not that', He cannot manifest as easily. He will still come, but it’s much easier when we, some of the Children of the Heart to be, know that He’s coming and help Him to come. And so, the Lord Maitreya, Who is a very magnificent being, reveals Himself as something enormous. If you understand about the Solar Logos, the great Spirit and the Being of the Solar System and you understand that Logos is a trinity in Itself, containing the Trinity of God, the Will, Love-Wisdom and Active Intelligence or the Mother, then you will see and find it logical that the Lord Maitreya is manifesting the Second Aspect of the Solar Logos, the Son Aspect of Love-Wisdom. He is a mighty Being, He calls Himself the Son of the Sun and, when He sings and He blesses and you hear Him speak, He has a completely different vibration and radiation than that of the Lord Jesus because when a Master uses another Master as an intermediary, people get the energy of the Master more than the Master within. So even though the Lord Maitreya has used Masters to speak through and act through in many thousands of years, He comes as Himself and that is a new vibration that has to be recognised, because it was not known before. So interesting, exciting things are happening on the Earth. In order to reach the Children of the Heart, it has become understood that a new yoga form was needed. A yoga, which like many yoga forms, takes another step. See, we’re all the time evolving. So on Atlantis we had Hatha Yoga to help us build bodies, strong bodies, and to learn to control the physical body, so that the ones who became Masters in those days only had to learn to control the physical body, then they were Masters. Later on, by the help of other yoga systems, they came to control the astral body, they became a Master; they learned to control the mental body, became a Master. Now it is much more difficult to become a Master, now it takes being able to work in the soul. And for that we have seen new yoga forms being introduced. And ever since I started to work with the Lord Maitreya this life, which happened in America, on the way from America to Australia, ever since that happened, I have, They have taught me about this new path, this new way They call the Way of the Heart, how the Children of the Heart can learn to walk it, what it takes to walk it. And though I have not written a sentence down, because I haven’t got it all yet, it will come in five, six years time. It has then taken more than 20 years to understand what the Lord Maitreya wants with the Children of the Heart and how He wants them to be trained. And if you look at the Theosophical Society and the books that were written, they were all leading up to this. I am going to show you something interesting that Ann will now put on the projector, something that recently has come to finish the puzzle, we say. step was needed, and then I understood all the steps. See, in 1875 the Theosophical Society was founded in America. It includes the Esoteric School. The Theosophical Society is meant to be a scientific application of the Divine Wisdom. Then in 1990, after I have worked since 1977, we got the name 'Society for Maitreya Theosophy', which we understood fairly quickly was to be an esoteric part, totally esoteric – the umbrella, the energy of the Lord Maitreya, surrounding these Theosophical focal points – where its spiritual application that you find up there and a connection to the two centres, Shamballa and the Hierarchy. The energy comes over the Theosophical Society. And The Theosophical Fellowship was founded in 1994, becoming the Brother- and Sisterhood that the Lords of the Hierarchy wanted to start through Blavatsky, but she passed away before it could be started, because time was not right. The Fellowship has different orders of service in it – Church Server Stream, Healing Order of the Holy Mother and Knights of Shamballa are the latest additions that will come to work within it. And now the latest and the complete puzzle being completed is the Foundation for Paramartha Yoga on the physical/etheric level with the Temple of Truth, practical application of Theosophy. And it will contain or include the Fund for Humanitarian Service, which will work to find funds to create the new society, or parts of it, so we can find money to make a little replica of it around Daylesford and Melbourne, that’s what Master would like now. America and everywhere else. But, this is the structure of the impulse that was created in order to manifest the Society and the impulse that continues to manifest other parts, other organisations that can reach humanity on other levels. Because the Theosophical Society is very much working energy-wise on the mental level, and therefore in the early days, and up to recently, really has attracted very intellectual and mentally stimulated people, but not humanity as a whole, not people who are seeking for spiritual wisdom, but couldn’t really grasp those very difficult books and theories. Fellowship, this is also working through Summit Lighthouse, which has written a number of books for many people about the Masters, because Elizabeth Clair Prophet is also part of this Plan, and works with her people whom she attracts, introducing the Hierarchy on other levels for people to be recognising Them, in future lives coming to know Them. I am just mentioning this because it is one of the organisations you know, but there are so many organisations on Earth and groups that recognise the facts of the Masters. But many Indian organisations don’t talk about the Masters and the Hierarchy but more their guru line. And the guru above the guru now sitting there. They never mention the Great White Brotherhood, if you have noticed it or know much or teach much, if they know at all about Their work for the whole planet and for every human being here. But the western organisations that have been created over the last hundred years, they do, many of them do. And that’s because of the stimulus that was released a hundred and some years ago. So even if it sounds as if we carry on the Theosophical tradition, it is also carried on, the work, by other people on Earth also inspired by the same energy. So that I would like to erase the mistake that you can’t hear about the Masters or this kind of work the Masters do anywhere else than here – which is of course not true, thank God for that. It has become very, very straightforward and through this work new books will be written, which will be more written through the heart, and that is why I was told by the Master, that’s where I was told the difficulty was. Why it has taken so long to be able to write anything down is that, you see, the Avatar of Will and the Master of, called the Lord of Love, They both have to accept the work and say yes before it is published – it is correct, you can send it, and so little of the work could be published because of that, but will see daylight within the next five, six years. It was just the opposite in the early days. We started writing and many groups were attracted, enormous lot of people were attracted and started to work with the Theosophical wisdom and deep meditation, and in this life it has been the opposite way happening. It has happened that we’ve got a lot of practical Theosophy, a new healing system, a meditation system, a church system and how to train church servers to work with the Lord Maitreya, the Light of Him, but the books have not appeared really. Slowly, slowly appearing and that has been an obstacle for our organisation, that people didn’t know that they could study all the Theosophical literature and they should, because there is such a lot written today by disciples who have written books easier to comprehend. For example, Alice Bailey’s books – very difficult to understand, but lots of disciples within the Arcane School are now writing books from the original books, making them easier to understand. So there is a lot of literature around, but there is no one who practices what is termed the Theosophical life through the Heart and that is what the Lord Maitreya wants to teach people.